But when I return from gathering herbs and checking my father’s snare line, I find my parents have been murdered, shot by thieves in the back as they tried to run. I have to bury them here in California, because the gold which would have sent their bodies back to China has been stolen. I weep and sprinkle the dirt which my mother brought from home over their graves. It is all I can do for them. The next day, I walk to the nearest mining camp and stand facing the eight men there. I cannot threaten them with the law. Chinese are not allowed to speak in court in California. “You Americans killed my parents. I am all that is left to carry on my family, even though I am only a girl. So you must give me a job so I can do this.” I stand tall and straight and use the best English I have, even though I am afraid when I see the smile on the face of one of the men. “I can cook and wash your clothes,” I reply. The murderers did not take our garden, and there are still my father’s snares. Food is very expensive here. The miners agree and say they will pay me in gold dust. I work long hours, but the miners work hard, too, so this does not bother me. They like my meals and pay me before I leave. And every day on the way home, I put my gold dust in a secret place, deep in a crack between boulders. Even if the murderers come for me, they will not get my gold. 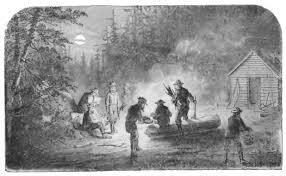 I bring my food to the miner’s camp one morning to discover a terrible thing has happened. The red-haired man, Sean, has broken his leg. He is my protector. I do not trust the other men without him and now he cannot fight. He has a gun, but I do not expect him to use it to defend me. I am only a girl. I will give him a reason to keep me safe. None of the other men want to work with him now that his leg is in a splint. But I do. “Sean, if you will pay me half the gold we find, I will dig gravel from the river. I will work the other side of the rocker with you. But the other men will have to wash their own clothes and buy the food for me to cook.” I try to hide how afraid I am as I look up into his face. The work is hard, harder than washing clothes and cooking. I must stand in the river all day, the hot sun beating down on my back and neck, and scoop up gravel and mud with my aching arms. This goes into the rocker, where the heavy gold is separated from the earth around it. Sean is very good at this part, and I watch him carefully so I can do it for myself someday. Sean is pleased with my efforts. He offers me his tent, saying he will sleep outside. It will not rain here for many weeks, so I accept. Sean and I find gold every day. I borrow his hatchet and cut him a staff so he will be able to walk farther. This works well and he laughs in delight. “May, you should’ve told me you’re so lucky—we would have done this from the start.” I smile and tell him I was born in the year of the monkey. I still cook for everyone, and I make certain to do Sean’s laundry, even though it means standing in the river when I so badly want to sleep. He is keeping me safe. It is a fair exchange. The day I have been dreading comes. Sean no longer needs the support of his splint or his staff. His former partner wants to work with him again. Sean will no longer want me. I am only a girl. But Sean laughs. “You had your chance. You partnered up with someone else and there’s no hard feelings. May’s my partner now.” I meet his eyes and he winks. My name is Mei Li, and I am becoming a woman now. A rich one. Is is really International Women’s Day? Excellent. On a completely unrelated note, my husband insisted on making pancakes because apparently it’s also National Pancake Day. It seems a completely silly holiday to me, but there you are. I like the setting, it’s one you don’t see much of, or at least I haven’t: Chinese people in California, during the Gold Rush. There were a great many, but unfortunately as a group, they were very shabbily treated. The bit about the courts is true.